Nanowrimo is here and as usual, I devised a cunning plan on November 1st. Of course we all know that the brain works in mysterious ways and so the whole thing was undoubtedly hatching in my subconscious before I knew what was going on. I had had several suggestions from my fans (all 2) that I undertake a children’s book for my next trick. Now that I am a grandpa I suppose the time has come. 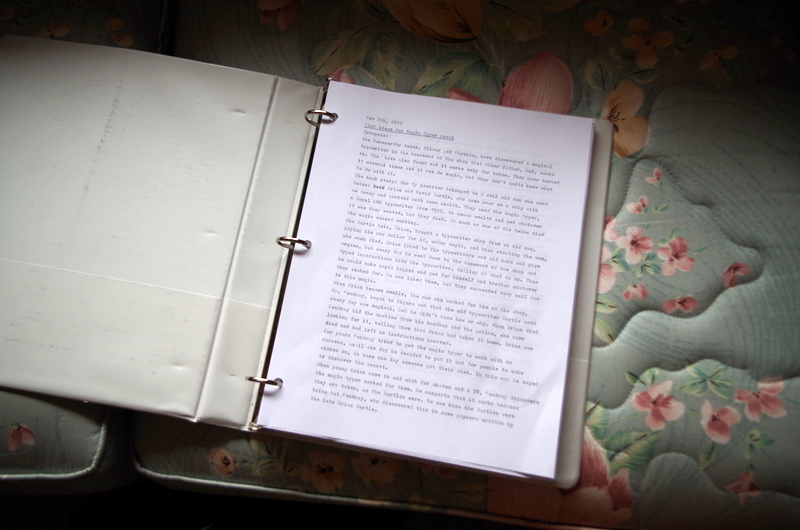 Regardless, the book is underway. 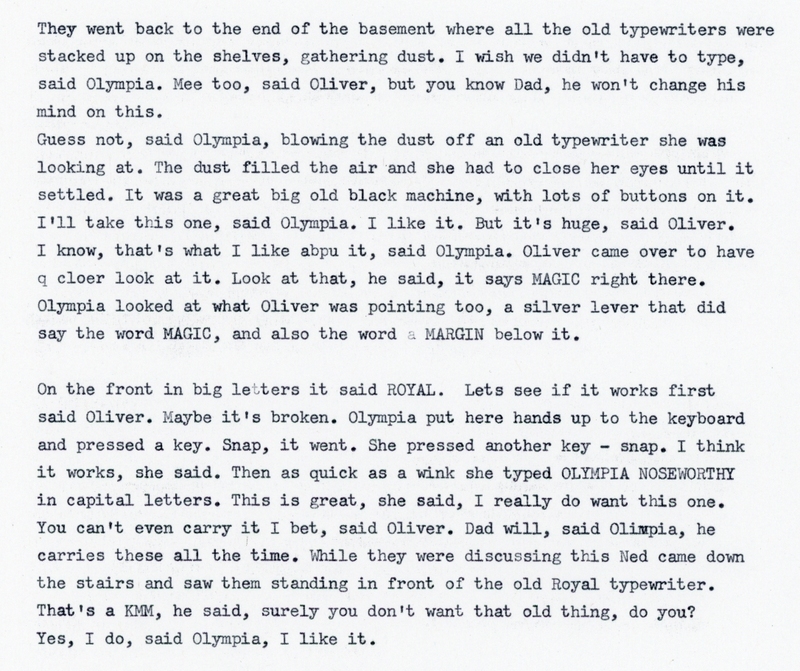 It is being typed, as all great literature generally is, on a manual typewriter. It also features a manual typewriter, Royal KMM 1939, with magic powers. This is indubitably due to the fact that the word MAGIC appears on it. Also because my Mom used one when she was a typist at the CPR long time passed. I think it was a KMM, and in any case it had the same big Royal logo on the back of it, so I accept that as evidence enough for this jury of me. Well, it’s going smoothly and I am enjoying the process. There really is no more gratifying experience than reading to a child, and this is kind of like doing that for a whole bunch of them. Hoping, naturally, that one day one child somewhere will actually read it! Maybe two or three… One minor glitch is that Nanowrimo has a 50,000 word target, and that is more words than most kid’s books. So I will try to write too much and edit it later. In actual fact – as if there are facts that aren’t (alternate facts aside) – I am using an entirely new method this time. I am editing as I go. This is often considered a no no, but I’m finding that it is improving my writing. I see so many things to rewrite that I’m avoiding repeating those sorts of errors whilst typing. Positive feedback loop through continuous iterative editing. Lastly I wish to report that I am using one of my Olivetti Studio 44’s, mainly. 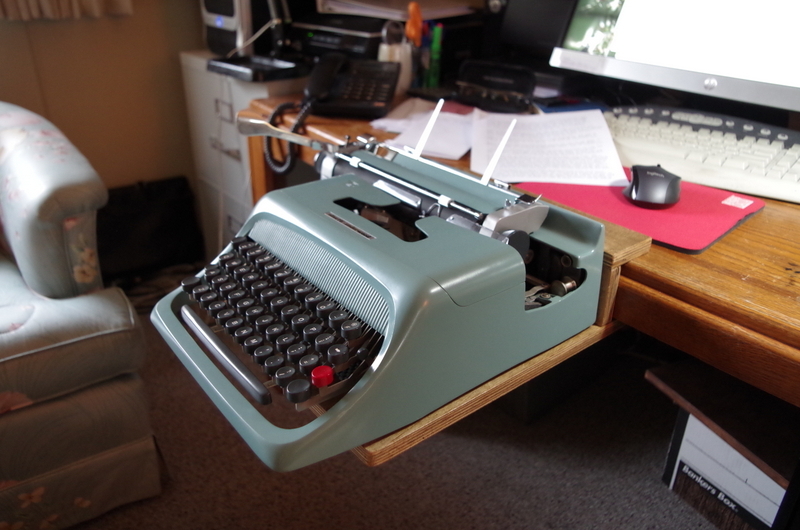 I dug it out of the basement and have discovered to my delight that it is a pleasure to type on. It easily beats the vaunted SM9 or any other SM’s. I prefer the SF models anyways, and I have used mine a great deal. I now have at least 7 of these, from various eras. They’re all identical under the hood. But for now I am sticking with the 44. It has a soft touch and that makes quite a difference with muscle fatigue, believe it or not. There is very little recoil. Some folks don’t like the softness of Olivetti’s, especially the 22, but for me I appreciate that, for their gentleness on the fingers, hands and forearm muscles. Last year I got a terrible pain in my elbow after a month of typing madly, which may have been exacerbated by the snappy action of the typewriters I used. Some are worse than others, but the 44 and 22 are some of the softest machines you can find.